Ah, the life of an Olympic athlete. Sure, years of pre-dawn training, but you’ve got to be able to eat whatever you want, right? Like swimmer Michael Phelps and his 10,000 calories a day or whatever? Well, yes and no. Vox has come out with an examination of “How many calories Olympians eat,” and the results for the winter athlete are a bit surprising. On the low end: ski-jumpers, who, let’s face it don’t do much more than fall off a hill. It also behooves them to be as light as possible, so that they can fall (sorry, “jump”) farther. Snow-boarders are down there too, since their 1620 flips and corks et al., while impressive, are pretty short-lived. Figure skaters also try to stay on the light side, the easier to be tossed across the ice rink or nail that triple axel. Longevity appears to be the key to superhuman calorie burns, as one group surges ahead of their wintry Olympian colleagues: the cross-country skier. Their journeys range from sprints to long distances of 30 km (women) and 50 km (men). Vox points out that these athletes “have the highest energy expenditure of any sport—even higher than running and cycling—because they use their lower and upper body strength to push through snowy terrain.” Sure explains the popularity of the NordicTrack. 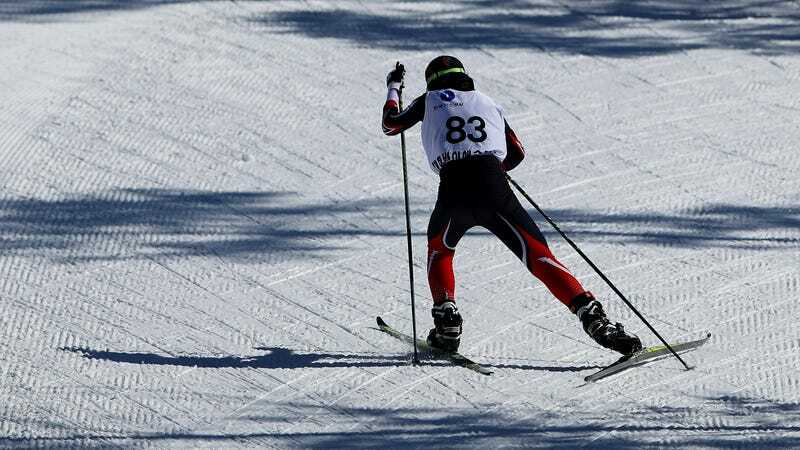 So we salute you, cross-country skier. You’ve earned those 5,000 to 7,000 calories, friend, enjoy them. Besides, we hear you can get McDonald’s for free over there.